FITS 6 TO 24 MOS - Sized to fit ages 6 to 24 months. The crumb catcher / catch-all pocket helps contain spills. Adjust fit with back tie closure and adjust sleeve length with elasticized cuff. Measures approximately 14" across the chest, 13" from neck down and 32" from cuff to cuff. Wipeable and machine washable for easy cleaning so you can use it over and over again! SAVING YOU FROM MESSES - Generously sized to help you save an outfit! 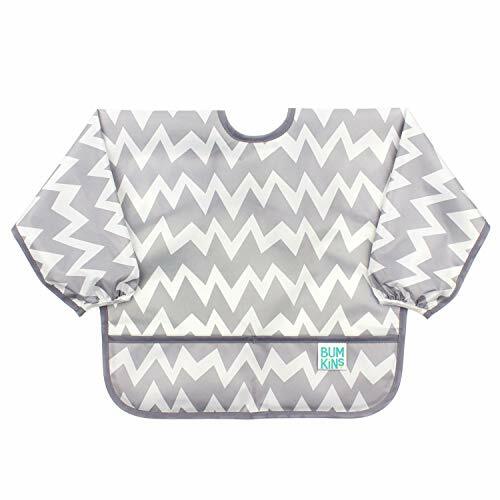 Our sleeved bibs are made from Bumkins lightweight, waterproof, easy-wipe, stain and odor resistant fabric. Single ply construction means no worrying about icky stuff growing between layers of fabric. Without a cotton layer, stains and smells don't stick. 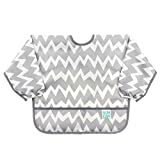 SOFT YET STRONG - Made from Bumkins signature waterproof, stain and odor resistant fabric that's both durable and soft, our bibs stand up to messes, yet are lightweight and comfortable.